Protect your networks from the most brutal environments with Ubiquiti's TOUGHCable industrial-grade shielded CAT5e network cabling. Built to perform in harsh and wet environments, TOUGHCable also includes a drain wire that can help ground ESD attacks. TOUGHCable "CARRIER" (level 2) incorporates secondary shielding and an anti-crosstalk divider for better Gigabit Ethernet performance. 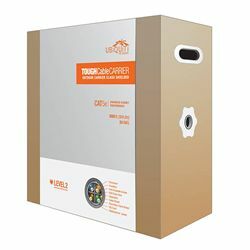 Use with TOUGHCable connectors to ensure thorough ESD protection with TOUGHCable cabling. Connectors and crimp tool not included.